If there’s one thing I love more than hot celeb gossip, it’s probably adorable animals. Seriously, who can get enough of cute animals on the Internet? When those animals belong to the celebs you love, it just makes it better. Both Ashley Benson and Taylor Swift recently posted pics of their furry friends being completely cute playing around in the house. 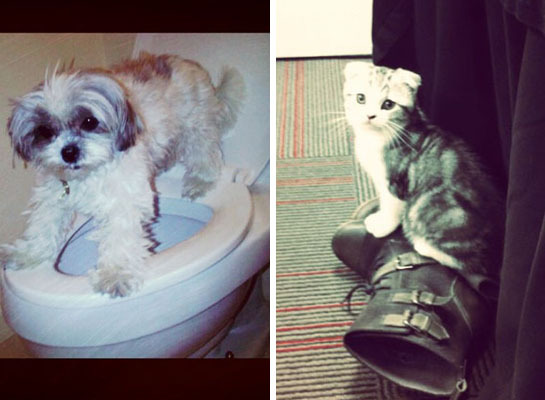 Ashley’s pup Olive seems to be attempting potty training and Tay’s kitty Meredith shows her take on Puss in Boots. I LOVEthe cute little kitty!!!!!!!!!!!!!!!! hi what’s your name what a cute little kittens they are.i want to adopt them but my father will not let me adapt kittens i wonder you could go here. see you later? really?? ?they are both adoribal!!!! !i cant pick one!!! I think the one on the toilet is soooooo cute!!!!! I know I’m a boy but the one on the left is sooooo sooooo cute!!!! but there both sooooooooooo cute!